There has been an increasing interest from the dairy sector for a cost effective and reliable method of covering existing stand-off pads and feed-pads. We supply and install Standoff Shelters for farms which can be used with dairy cows to keep the herd warm, dry, fed and healthy. 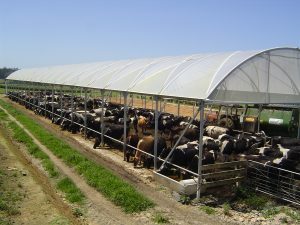 Clear roofing membrane called ‘Durashelter’ helps with the drying of floor effluent, maintaining cow cleanliness and helping to reduce the incidence of disease while keeping the heard warm. If used over the summer months, a vented system can be put in place to help with air flow. Gutters are also included along all pole lines to ensure that water from the roof of the shelter can be trapped and drained, and sidewall eave hangers for side feed protection can be added as an additional feature. Covered standoff shelters can minimise stress placed on pastures, providing an area to hold cows for extended periods in poor weather, and also reduce labour during calving by keeping the cows close at hand. Redpath standoff shelters are made in New Zealand, using a modular frame design made from strong RHS framework and roof trusses with bolted structural connections. The height of the shelter allows easy access for machinery in the shelter. By using the modular system, shelters can easily be expanded in either width or lengthwise direction in future years. All shelters come with a manufacturer’s warranty. Ecoshelters are very popular for housing pigs, goats, calves and chickens, keeping your animals dry, warm and healthy. Depending on the location of the shelter, they will usually be supplied with Durashade, Duraflex or Duratough roofing cover, and their all bolted RHS box section tube design enables them to stand up to high winds. Ventilation for the animals is provided by either natural side rollups, a roof vent system or an air forced fan ventilation system. Bay Orchard Shelters Ltd. is a privately owned family business with 30 years experience in the Bay! As agents of New Zealand made Redpath Greenhouses we can provide a complete business solution from purchase to completion, including the service life for the building. We cover the Bay of Plenty and Waikato region and offer free site visits, quotes, and expert advice. All Rights Reserved. © 2019 Bay Orchard Shelters.